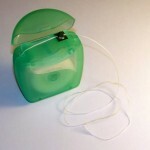 Floss or Toothpick – Which is Better? Question: Is it OK to use just a toothpick to clean between teeth? The toothpick is a commonly used tool to help dislodge food from between your teeth. Toothpicks are handy, convenient and readily available. And while they are helpful in dislodging food from your teeth, toothpicks are not designed for dental cleaning and should not be substituted for flossing or brushing.